As a small business owner, there’s probably a long list of questions you’d like to have answers to. You may have some thoughts on the answers to these questions, but really need a better way to confirm your ideas. This is one example of how conducting a survey can help. With an online survey tool, you can easily create a series of questions to provide the insights you need. You can then promote your survey out to your audience — using channels like email and social media, and capture your participants’ responses in an easy-to-read report. 1. 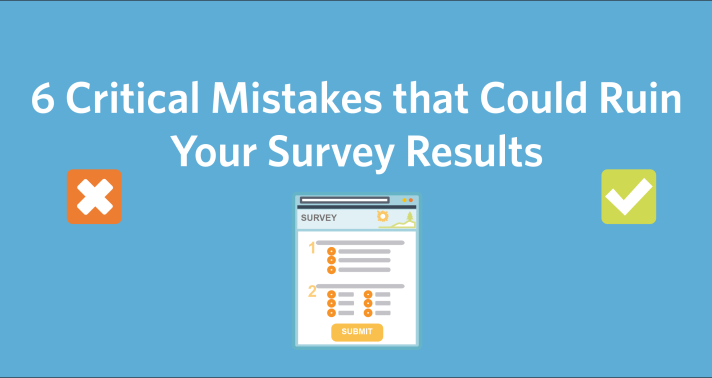 Your survey questions are not relevant to your strategic goals. If you don’t know where your business is heading, then you won’t be able to ask for your customers’ feedback in this direction. Be sure to define your business’s goals and what you need to know about your customers in order to accomplish these goals before you write your survey. For example, if your goal is to grow your business, you may want a better understanding of what your customers’ needs are. Are your hours, products, services, and/or customer service meeting their needs and expectations? 2. The questions you ask do not relate to the information you are seeking. If you don’t think through what information you are looking for ahead of time, you may not capture all of the rich details about your customers that you could in your survey. For example, perhaps as part of your growth strategy you will be looking to serve customers in different regions of the country. Since location is important to your business model, don’t forget to collect City, State, and Zip Code information using the “Collect Personal Information” question type. On the other hand, perhaps you are looking for more information on what customers currently like or dislike about your products. You could ask your customers to rate each product on a scale, and then probe with an open ended question to understand why they like or dislike certain products. If you don’t word questions carefully, you may create confusion and misunderstanding amongst your respondents. Watch out for specialized language or acronyms. Remember that you think about your business every day, but your customers are coming from a variety of backgrounds. Write your questions in accessible language that everyone can understand. 4. You don’t pre-test a draft of the survey to get customer feedback ahead of time. One way to ensure that your survey makes sense to your customers is to select a few customers ahead of time and ask for their feedback. Did they get confused by any of your questions? Were they able to find a relevant answer choice to your multiple choice questions? Make adjustments based on this feedback. 5. You make your surveys too long. It is always tempting to ask about everything that’s on your mind; however, your customers will appreciate if you keep the survey short (about 10-12 questions). If you are having trouble narrowing the scope of the survey, focus on just one or two business goals. Remember, you can always ask for additional customer input at a later point in time. You don’t want to take too much of your customer’s time all at once. 6. You don’t think through how you will analyze the data ahead of time. It’s a terrible feeling to get to the analysis stage of a project and realize that you don’t have the data that you need. For example, if your business goal is to better understand how your customers heard about you, and whether or not this varies by location, you will need to make sure you collect information on geographic location. Thinking through how you want to analyze your data ahead of time will help you ask about the relevant characteristics of your customers when you are designing your survey. Avoiding these common mistakes will ensure your survey collection efforts get you the information you need to understand your customers and meet your business goals. Ready to create your first survey? Log in to your Constant Contact account and get started today! Not a Constant Contact customer? Start your free 60-day trial!